Excellence in Journalism 2014 drew more than 1,000 attendees in Nashville. The Kiplinger Program was there, as director Doug Haddix and deputy director Kevin Smith presented their “Digital Dirty Dozen” tools that no journalist should do without. See their presentation. Part of the challenge of Twitter is scooping up relevant tweets before they vanish into the digital abyss. My favorite low-cost tool? TweetArchivist. The recent national Excellence in Journalism convention in Nashville provided a real-time test of the service. Results have been impressive: more than 8,400 tweets captured and downloaded into an Excel spreadsheet. Plus, TweetArchivist produces eye-catching visuals and charts with key analytics tied to a hashtag. Here’s how it works: Simply set up an archive by typing in a hashtag, key phrase or Twitter handle that you want to track. Every hour, TweetArchivist updates the search and lassos the results. At any point, you can download the results into a PDF file or an Excel spreadsheet. Online, you can click through various charts and graphics to explore the Twitter conversation. Pricing is flexible. I chose a one-month plan ($19.99) that allows tracking of up to three archives. That’s ideal for a conference or news event that’s contained to a short time period. A recurring monthly subscription costs $14.99 for three archives; it can be canceled any time. For journalists, the service could be used effectively to track hashtags on the beat or key sources. During an election season, TweetArchivist could provide an automated way to gather and analyze each candidate’s campaign. On a 90-degree day last July, more than a dozen journalists holed up in an upstairs meeting room at the Ohio State University campus. The air conditioning was cranked but the committee was still sweating it out. Before them was projected the preamble for Society of Professional Journalists code of ethics. It was their job to revise it. The group, wordsmiths all, spent 90 minutes parsing just 56 words of the prologue; this after a yearlong debate by SPJ members on the nuances of the language. 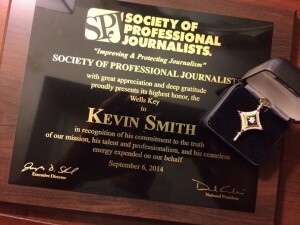 Spearheading the changes was outgoing SPJ ethics chair Kevin Z. Smith, who also serves as the deputy director of the Kiplinger Program in Public Affairs Journalism. He had spent months piecing together various edits of the new code, orchestrating plans for the meeting, even arranging for a “geographic” food exchange among the committee. But in the sixth hour of revisions, someone broke out the Georgetown cupcakes, St. Louis crumb cake and the chocolate-covered toffee, effectively ruining the exchange. The committee needed a sugar boost and Kevin didn’t protest. The task at hand was too important. That’s because journalism ethics is eminently important to Kevin, who served for 23 years served on the ethics committee, two terms as its chair. Whatever it took to hammer out this much-needed code revision, he was going to support. This was his baby. 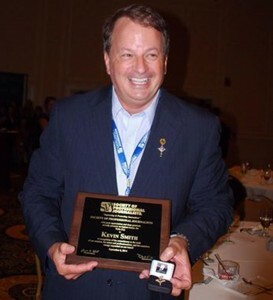 So no one was too surprised — except Kevin himself — when he was awarded the Wells Memorial Key at Excellence in Journalism 2014 conference in Nashville Saturday. The award, named after the second president of Sigma Delta Chi, Chester C. Wells, is the highest honor an SPJ member can receive. “No one deserved it more,” one tweet read. 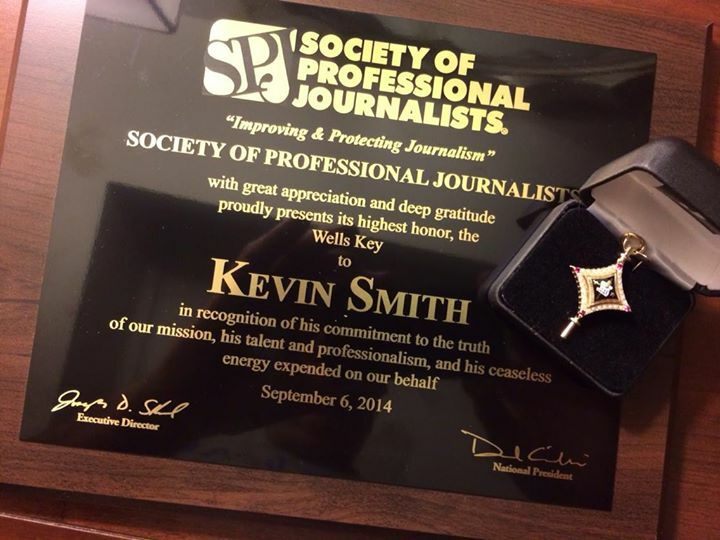 Kevin was praised for his commitment to ethics and to journalism in general.